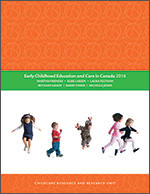 Early childhood education and care in Canada, a compilation of cross-Canada data on child care, kindergarten and other key information, has been published about every two years since the early 1990s. This report, Child care space statistics 2007, represents the first time since ECEC in Canada began that early childhood education and data have been collected and published in an interim year. This report includes only data on regulated child care spaces. For the most recent ECEC data compiled on topics such as financing and regulation in child care and kindergarten as well as 2005-2006 demographic information, refer to Early childhood education and care in Canada 2006. See also Trends and analysis 2007. There were 837,923 regulated child care spaces in Canada in 2007. This represents an increase of 26,661 spaces since 2006, the smallest increase in regulated child care in some years. In comparison, between 2004 and 2006, supply grew by 65,337 (an average of 32,668 in each year) and by 152,493 between 2001 and 2004 (an average of 50,831 a year for each of those three years). Since 2006, there has been limited change in the number of regulated child care spaces in most provinces/territories, with expansion in Quebec slowing sharply. In 2007, 83% of total regulated child care spaces for children aged 0-12 were centre-based; of the 837,923 spaces, 697,242 were in centres with the remainder - 141,581 - in regulated family child care. In 2007, 57% or 398,197 of centre-based spaces were for children aged 0-5 while 43% or 299,289 spaces were for school-aged children. Quebec has more than 160,000 school-aged spaces which include children aged 4 -12 years. In 2007, 80% of centre-based child care spaces were not-for profit (including publicly-delivered child care in Ontario and Quebec), a slight increase from 79% in 2006.